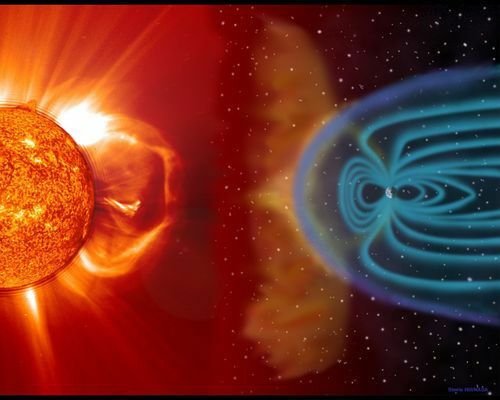 Increasing observational evidence on the biological effects of Space Weather suggests that geomagnetic disturbances may be an environmental risk factor for multiple sclerosis (MS) relapses. In the present study, we aim to investigate the possible effect of geomagnetic disturbances on MS activity. MS patient admittance rates were correlated with the solar and geophysical data covering an eleven-year period (1996–2006, 23rd solar cycle). We also examined the relationship of patterns of the solar flares, the coronal mass ejections (CMEs) and the solar wind with the recorded MS admission numbers. The rate of MS patient admittance due to acute relapses was found to be associated with the solar and geomagnetic events. There was a “primary” peak in MS admittance rates shortly after intense geomagnetic storms followed by a “secondary” peak 7–8 months later. We conclude that the geomagnetic and solar activity may represent an environmental health risk factor for multiple sclerosis and we discuss the possible mechanisms underlying this association. More data from larger case series are needed to confirm these preliminary results and to explore the possible influence of Space Weather on the biological and radiological markers of the disease.